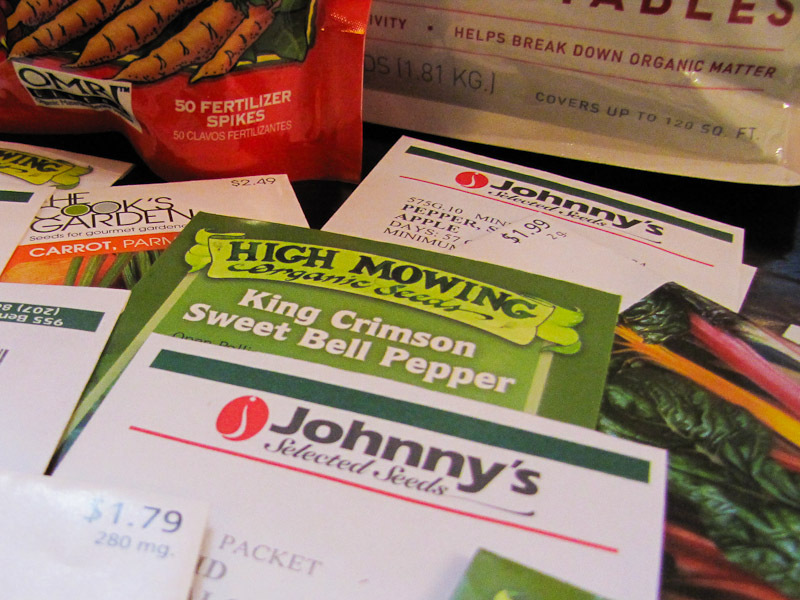 This year's seeds were mostly bought from High Mowing Organic Seeds and Johnny's Selected Seeds. A few were impulse purchases from the local big box store. The radishes and beets are courtesy of Gardening in the Boroughs of NYC, thanks again Mimi! Everyone speaks very highly of Sun Gold cherries so I'm curious to see if they'll replace Orange Paruche as my new favorite. I wasn't sure if I was going to grow cucumbers this year. Last year I could never figure out when to harvest them to avoid bitterness, it was always a crap shoot, but I've read that lemon cucumbers are never bitter so that solves my problem! Last year I grew Gretel eggplants, the year before that I grew Hansel, this year I'll complete the eggplant trilogy with Fairy Tale. I'm sure it will do just as well on the roof as the others (hopefully I didn't just jinx myself). No peas this year. The time spent maintaining last year's pea plants versus their return were not worth it to me. The tall pea plants were a complete hassle to maintain on the roof. They climbed a reed fence, but the tendrils were not strong enough to maintain their hold during windy weather, which was pretty much all the time, so I had to use a lot of twine to keep the plants up. Also, I spent a lot of time digging through the foliage to find one or two pea pods at a time. If I did this during spring I wouldn't mind, the weather would be nice and I'd probably be on the roof anyway. I can't say the same for fall. No hot peppers this year either. No particular reason, I just forgot to buy some! Maybe I will be. 7 days from green to red!! I'm going to germinate all 10 seeds and give away whatever I don't plant. Local gardeners stay tuned. I still have some seeds left from last year to giveaway so check the 2010 seed giveaway post if you're interested. I'm finally catching up on reading your blog, Wait a sec, the radishes that you are growing on your windowsill are the seeds I sent you! Wow!!! I have to try it now! LOL. That is way cool! I never thought to grow radishes indoors before. Awesome idea! Which ones are you growing inside, the cherry belle or the french breakfast? Hi Mimi, I'm growing both types on a south facing window. I have desk light on them as well.